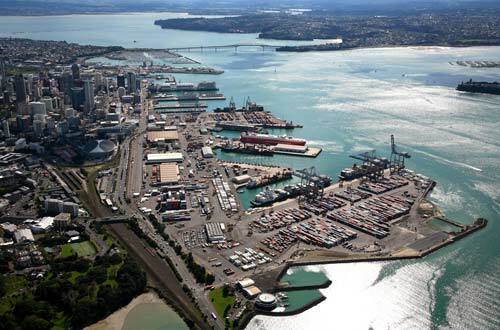 The future of Auckland’s port has become the subject of some media attention recently. Is it going to be privatised? High level discussions are under way over the future of Ports of Auckland as Auckland Mayor Phil Goff wrestles with how to fund the city’s ballooning infrastructure costs. But Goff is refusing to be drawn on whether he plans to sell the council’s ownership stake, saying only he wants to address the port’s long-term future this term. The Herald understands an IPO, or initial public offering, of the port is being discussed in merchant banking circles. Either a sale of the operating company or a part sale of the entire entity is understood to be under discussion. Goff would only say he has had wide-ranging discussions on Auckland’s port but no specific proposal on ownership has been presented to him. During the last election campaign Goff talked about the future of the port. It is a feature of developing city ports that as time goes by and the city grows the relationship of the port to the city changes. Initially they are an important piece of infrastructure as a transport node but as time goes by and the city develops the port function becomes less and less important and the value and future use of the occupied land becomes somewhat critical. It is an important issue for a growing city. Maybe we should think of a future where there is no inner city port. As an example Sydney and Melbourne ports have gone through similar changes. Ports of Auckland is essentially owned by Auckland Council. The port has already been a source of major frustration for progressives because of POAL’s attempt to deunionise the site. The amount of money spent on this particular fight was obscene and unjustifiable unless the activity was necessary to facilitate its privatisation. There are an extra billion dollars on the table in Wellington for Auckland transport if the city agrees to sell its port company. The city’s Mayor, Phil Goff, has confirmed that he has received a briefing from the Ports Company proposing a privatisation. POLITIK has learned that the Government may be willing to stump up an extra one billion dollars for transport projects if the port – or other assets – were to be sold. Given that the company is worth approximately $1.1 billion the Government appears to be proposing a dollar for dollar subsidy. A busway and other work on the North Western motorway. The offer reeks of bad faith politics. The North Western busway is to give the Government cover because the decision not to build the north western busway over the past few years while the north western motorway has been rebuilt is stupidity of the most extreme level. The busway to the Airport is clearly to try and dull the effect of Labour’s light rail to the airport policy. The problem for Auckland Council and for Goff is that current Council debt levels are close to the maximum comfort level. Debt is currently $7.6 billion and just below 270% debt to revenue ratio. Although the Council has an urgent need of funds for the construction of new infrastructure its ability to borrow further is limited. And the Government has turned down every request by Auckland for alternative funding streams. A request for reinstatement of the ability to put a regional fuel tax in place has been turned down. And Goff is having to use a targeted rate to create a tourist bed tax. So Goff is caught in this difficult position where Auckland urgently needs further funds but the Government is refusing to allow it the new revenue streams it desperately needs. And Goff’s analysis is that anything above a 2.5% rates rise is politically risky. The problem is that an increase of this size would mean that the per head of population spend would decrease at a time when it needs to increase. Labour would strongly oppose the sell-off of the Ports of Auckland to fix a short term cash crisis caused by the Government blocking the city’s requests for new ways to fund infrastructure, says Labour’s Auckland Issues spokesperson Phil Twyford. “National has blocked every request Auckland Council has made for new sources of revenue to invest in desperately needed infrastructure, including road pricing and a regional fuel tax. And now the usual cheerleaders for privatisation are telling the Council to flog off the port company to fund the infrastructure deficit. “Of course the merchant bankers and the international investors will be salivating at the chance to sink their teeth into the port but let’s stop for a second and think about what’s good for New Zealand. “The country needs the future of the upper North Island ports to be resolved on the basis of what’s good for the long term prosperity of New Zealand. Privatising the port now could jeopardise that process. There are councillors such as Mike Lee and Cathy Casey who would vehemently oppose any privatisation. This issue could present Phil Goff with his biggest headache as mayor.